We headed to Deerfield Beach one evening to find some seafood near the ocean. Once there, the decision of what restaurant to eat at was made mostly by which restaurant offered free parking. Turned out The Whale's Rib was one of the few restaurants in this part of town that didn't have meters charging $0.25/ five minutes. I suppose that's a good thing, because apparently The Whale's Rib has some Food Network credibility. My meal came with a side salad, consisting of romaine lettuce, tomato, onions, cucumbers, croutons, and balsamic dressing. For my main course, I had the California Shrimp & Scallops. The menu described this as being artichokes, pepper, and onions over spinach pasta. When the plate arrived, I was initially impressed. The colorful plate of pasta had lots of huge shrimp and scallops and three good sized garlic rolls. I could have done without the mushrooms that were also added to the pasta, mentioned nowhere on the menu. I'm really not a big fan of cooked mushrooms. Overall, the pasta was also a bit boring tasting and could have definitely used a bit more flavor in the sauce. I ended up adding some salt to give it more flavor. I picked up take-out a couple of times from a Lebanese restaurant in Melbourne called Middle Eastern Aromas. It's located in a somewhat dilapidated looking strip-mall and is half restaurant, half Middle Eastern market. I've picked up cans of stuffed grape leaves from the market on each of my visits! I tried their falafel pita sandwich, filled with falafel, lettuce, tomato, parsley, pickled cucumber, and tahini. The falafel had plenty of flavor and the pickles were interesting. In other Lebanese restaurants, pickled turnips seem to be more common on sandwiches. 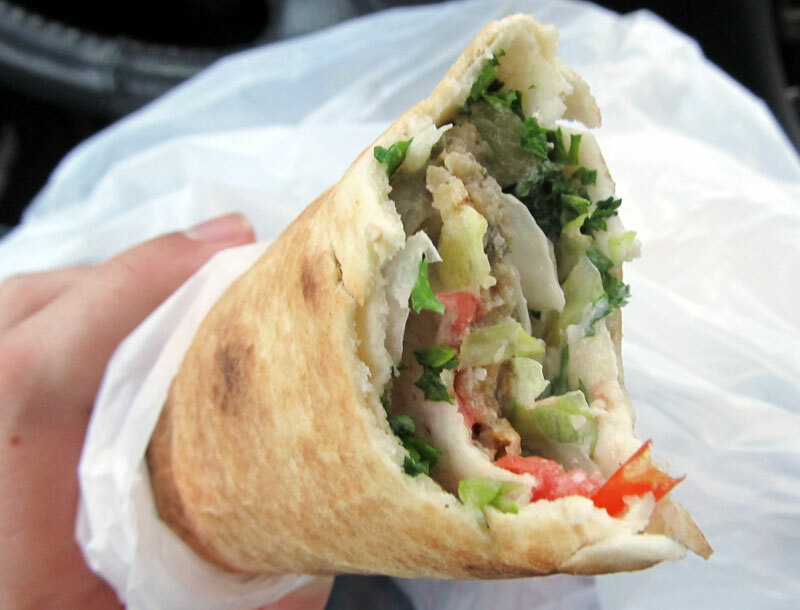 On another visit, I had the Chicken Shawarma Pita. This sandwich contained chicken, french fries, lettuce, tomato, pickled cucumber, and garlic sauce. The fries didn't seem to fit in with the rest of the pita in my opinion, although that garlic sauce was wonderful. I must have stunk for days afterward, but it's really good stuff. I tried a food truck in Melbourne called Big Jims Bar-B-Q. Big Jims seems to be set up in a semi-permanent location along 192 in an empty lot occupied with the main trailer, a couple of smokers, and some picnic tables. I decided to get the pulled pork sandwich combo, served with two sides. I tried the collard greens and cornbread for my two sides. I liked the collards, but the cornbread was very dry and could have used some butter for some extra flavor. After a day at the beach, I tried a restaurant/seafood market in Ormond Beach called Hull's Seafood Kitchen. Hull's took up an entire strip mall, half of which was the seafood market that sold all sorts of interesting edible sea creatures, including some live stuff. The other half of the building was the restaurant. Some of the fishy smells from next door did drift into the restaurant, but I suppose that was just a reminder of the reality of seafood. Travelling Gourmet is one of the newest food trucks to start serving in Orlando. They sell organic & local foods, all out of their trailer. They were at the Orlando Food Truck Bazaar #2 and I decided to give them a try. I had the Pork Lettuce Wraps, served with a side of plantain chips. The pork came locally from Palmetto Creek Farms and the greens came from Heart of Christmas Farms. The lettuce wraps were topped with corn, black beans, and feta, resulting in a very tasty flavor combination. I'm not sure if Travelling Gourmet is serving anywhere on a normal basis around town or if they just come out to events like the Food Truck Bazaar. Either way, I'd give them another try if I spot them around town. I went searching for a late night dinner upon arriving in Boca Raton on a recent evening. My initial idea of getting take-out Turkish food didn't go over well with the picky eater that I was bringing food back for, so Turkish food suddenly turned into pizza. I found myself at a restaurant called Brooklyn Boys Pizzeria and picked up a few slices to bring back. I love how most South Florida pizzerias serve good NY style pizza by the slice. It seems like just about every pizzeria you go into down there always has slices ready to go, and the slices always seem to have a really good turnover too. Brooklyn Boys served some good pizza. Nice thin crust, good amount of cheese and sauce, and very tasty. The crust could have been a little crispier, but otherwise I have no complaints! With so many trucks at the Food Truck Bazaar, I unfortunately wasn't able to try everything. I limited myself to three different trucks, including Island BBQ, Traveling Gourmet, and Sunset Ice. Check back in the next few weeks for blog posts on the food from these individual trucks. While up in our state's capital city, I stopped for lunch at a restaurant called Circa Thai Food & Sushi. They had some good lunch specials going on and I ordered the Green Curry Chicken. It came with a choice of soup or salad, and I went with the miso soup. The curry chicken came on a large fish shaped plate, with a side of pad thai noodles and rice. Unlike so much of the Thai food I've had lately in Central Florida, this curry chicken was good and spicy. The portion was huge and the price was good too. No complaints about my lunch. One of the highlights of the restaurant, although I did not partake, was their sushi buffet. A conveyor belt ran through the center of the restaurant, filled with various rolls and sauces. $12 allowed you free reign to take whatever moved on by. I was really thinking of getting the all-you-can-eat sushi, but Thai food sounded better to me on this particular day. We need a restaurant with a sushi set-up like this in Orlando!